Minister for Agriculture, Michael Creed has again highlighted that Ireland would make a case to the European Commission that support for its primary producers would limit any possible contagion from UK tariffs to other European countries. 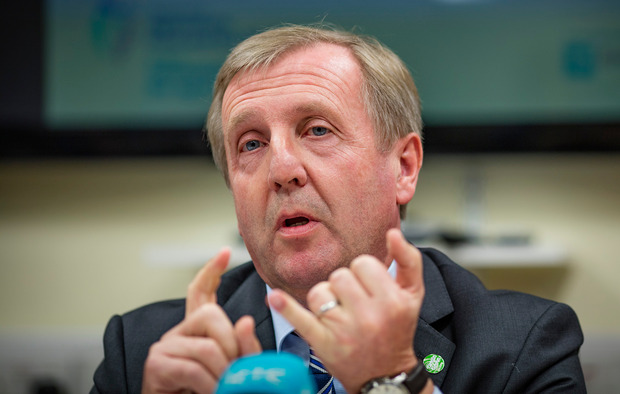 At the Fine Gael conference at the weekend Minister Michael Creed farmers a “substantial” aid package if they suffer losses as a result of new UK tariffs under a no-deal Brexit. “Because otherwise, we’ll be looking for a home for 300,000t of beef in other European Union markets,” Creed told Reuters in an interview. Creed gave the same warning at a meeting of fellow European Agriculture Ministers in Brussels last week. He said an outcome which results in a disorderly Brexit, would have a profoundly negative effect on both the Irish and the UK economies. “The Irish agri-food sector will be uniquely affected, with beef particularly exposed. The impact is likely to be immediate, and without support, at least in the short term, many of our beef farmers will struggle to survive. “If Irish beef loses its competitive position in the United Kingdom market, there will inevitably be knock-on consequences, with significant displacement to elsewhere in the European Union,” he said. The IFA estimates that WTO tariffs on Ireland’s beef and livestock sector will impose a direct cost of €800m per year, devastating the €3 billion industry and putting thousands of farmers out of business. Creed said the government will seek to provide domestic state aid such as grants and intervention. Dublin may also provide private storage aid (PSA) for the industry, an EU measure usually reserved for smoothing out seasonal imbalances between supply and demand. However, last week the Government delayed plans to unveil a package of emergency financial supports for farmers and small business owners who will be severely affected in the event of a disorderly Brexit. The Cabinet is now putting off plans to announce the vital emergency aid package in the wake of on-going Brexit chaos in the British parliament. It is understood the package of financial measures has been drafted, but yesterday it was decided they should not be discussed by ministers at Cabinet this afternoon, as originally planned. A senior source said the Government wants to see the “severity” of the Brexit the country is facing before publishing the supports.